You may already be familiar with DC sponsored snowboarders, Simon Cudlip and Faye Young, as we previously teamed up with the two adrenaline junkies on the slopes of Austria. This weekend however, we decided to take them off the slopes and chuck them into the deep end of the New Forest Waterpark. 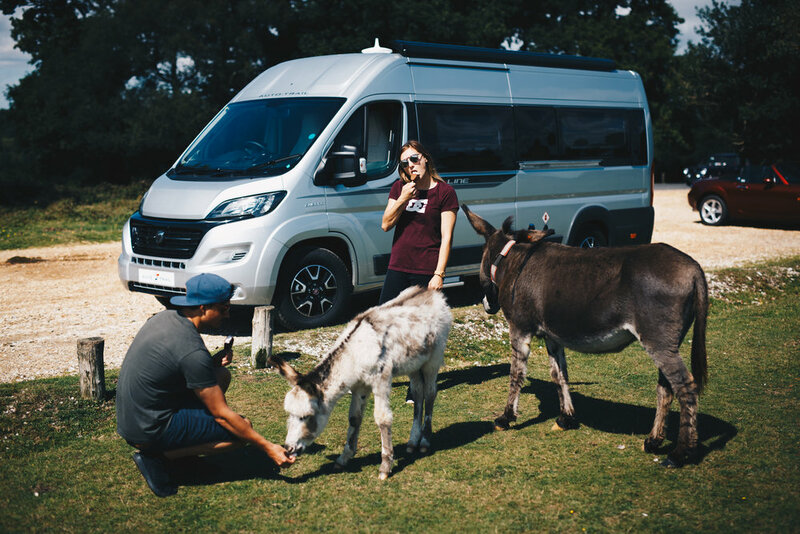 When not shredding it out on the lake, Simon and Faye were giving us a cribs-styled tour of their weekend accommodation and ride. As the night drew closer, so did some of their mates. They put on a pretty good summer party and luckily we had no neighbours to worry about! The next day they were assing around with some new found friends. The whole weekend was a blast and we can't wait to share all the new and exciting long-form pieces we've been cooking up in the Vintra lab. Stay tuned. 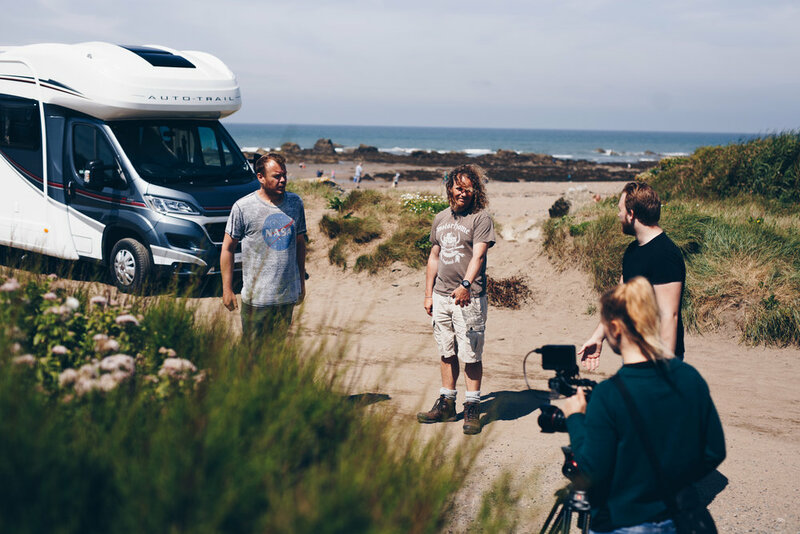 Our adventure started in the sunny Cornish town of Bude and we shortly began filming our cooking documentary with Martin. This may have been a work trip, but it sure didn't seem that way, as we were staying and filming in such stunning locations. Once we had soaked up the sun, it was time to get to work and our first task was to hunt down and forage some sea beet and rock samphire. The first part of our foraging mission was a success and we then travelled to Martin's secret mussel picking location. We arrived to our top secret location at low-tide, as this was key to spotting and picking the exposed mussels. 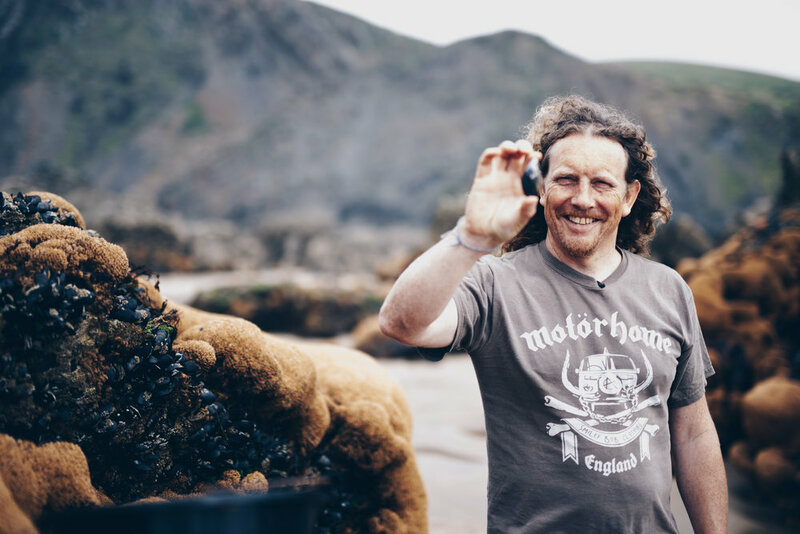 We spent a good few hours on the rocks picking the freshest mussels Cornwall had to offer. The tide was slowly creeping back up on us and with a storm approaching, it was time to head back to base. Martin then cooked us all a delicious meal and taught us some tricks of the trade, which will be making an appearance in the video. To celebrate the release of Olly Murs and Louisa Johnson's new track, Unpredictable. Our in-house video creative, Alessi, travelled to the Sony Music Studios to team up with filmmaker Zack Langsdon and Britain's Got Talent finalists, DNA Mind Readers, to show that not everything is unpredictable. Louisa Johnson's reaction says it all. Due to Olly and Louisa's busy schedules, the shoot was very much run and gun, which led Zack and Alessi to decide on having a small camera footprint, making them more agile for the shoot. The video is set to be released this summer, so watch this space for updates! This is not the first time Alessi has collaborated with Zack. 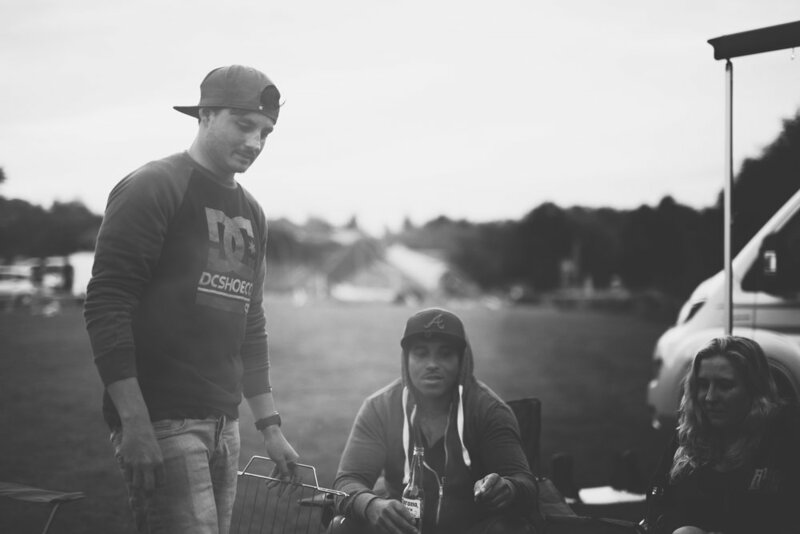 They both worked on a Lynx campaign called #isitokforguys and filmed major celebrities such as Anthony Joshua, William Poulter and Wiley. The campaign was aimed at raising awareness for the high suicide rates of young males and some of the videos can be seen below. We end the month with some of our favourite videos the team have chosen as their April must sees, watch and enjoy! From an early age we're told not to believe everything we see and hear on television and of course, the Internet, but does this advice still apply when watching nature documentaries like the BBC's highly acclaimed Planet Earth series? Simon Cade seems to think so and explains why you'd be wrong to think otherwise in this video. "Manipulating" footage is something any skilled editor can do and the amount of "manipulation" varies with each editor. A common example is cutting and rearranging interviews to make a stronger narrative. Below is a video we created for FTSE 100 giant, Legal & General and contains "manipulation" techniques to construct the narrative. This is common practice for most documentaries, but nature documentaries are meant to be factual representations of the different wildlife and environments they show. Understandably they do have to tell a story, but the question of how far they can push the truth to achieve this is something that is a very present issue. In the top video, Simon explains why controversial techniques such as CGI are used, how they're done and when they cross the line and go too far. Cade perfectly summarises his argument by stating that “Storytelling is what engages us, not facts and figures... And so what some people could see as fakery, becomes something we can actually learn from.”. Although this may be an obvious one, most people forget that their equipment needs to be kept warm too. Disposable hand warmers are our first port of call for keeping un-climatised cameras and lenses warm in sub-zero temperatures. Batteries should always be kept inside your jacket and in the warmth to maximise their efficiency. Climatising your gear is critical when shooting in sub-zero temperatures, as it prevents condensation from gathering on your camera and lenses. To do this, we put our equipment into zip-lock sandwich bags with a silicon gel pack and leave them in the porch, boot or outside for 2-4 hours. The zip-lock bags means that any condensation will form on the outside of the bag and not your lens. The same step should be repeated when bringing equipment into the warmth. Expect your batteries to last half as long as they would normally. The cold is a real killer to electrical items and batteries are no exception. To maximise their efficiency, you should carry them inside your coat and store them in the warmth. The failsafe plan however is to just have power in numbers, stock up. With a vast variety of apps ranging from weather to aurora trackers there is really no excuse for not planning a shoot, especially when it's going to be -25°C. When trying to capture the Northern Lights, planning is essential, as there are so many variables in play. Firstly we will check cloud coverage and have strangely found the APPLE WEATHER app to be the most accurate. We will then check out the AURORA FORECAST app to see the Northern Lights activity and if it is worth venturing out into the cold for hours on end or not. Despite all this, sometimes local knowledge plays a key role for finding those iconic spots and whether or not you'll have a chance of seeing the auroras, so ask around. There's no denying that filming in cold weather is tough and pretty gruelling at times, so why not bring some friends to liven up the experience and boost morale? (we also suggest a portable speaker and some added beers too). Our Arctic Adventure films are nearly here! The successful trip consisted of travelling 5,000 miles through 12 countries in just 16 days! The trip was orchestrated by BAILEY OF BRISTOL and drew in some major attention and big sponsors such as VOLVO and CAMC. HELSINKI TO SOMEWHERE IN REMOTE FINLAND? All in all, the trip was a huge success! Be sure to check in next week to see our live video from the Arctic Adventure. To find out more info on the shoot or to enquire CLICK HERE. 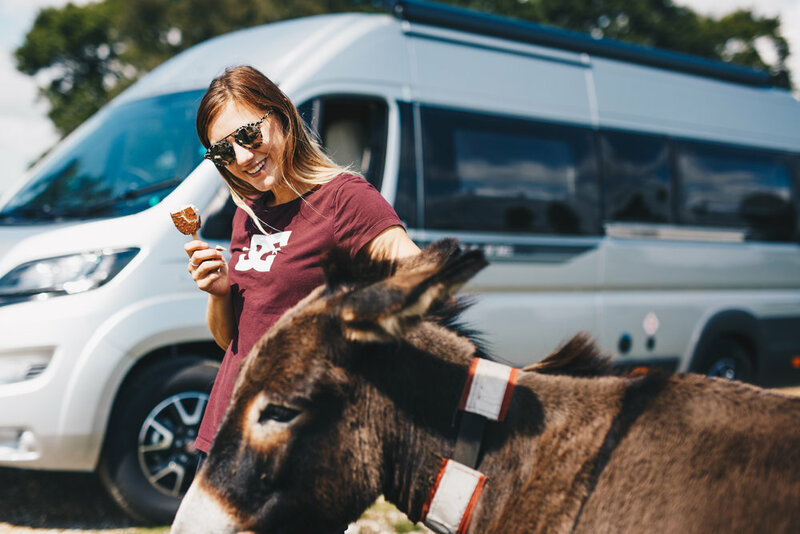 It was W.C Fields that said “Never work with children or animals” but the team here at Vintra have routinely flaunted that rule and in the last month alone we’ve done both, even on the same shoot! Exploiting the cute factor is always a great way to catch peoples attention, some of the most popular videos on the internet of all time feature our furry friends, so we thought we’d share a few of the teams favourites before we share some tips for getting the best from your shoot featuring animals. Most recently we spent the day with one of our favourite clients, DogsTrust, so we thought we’d share everything we’ve learnt from working with them and their canine companions over the past few years, about getting the best out of the talent. Animals don't take great direction, but they can sense when you lose your cool, stay calm even if the "talent" isn't playing ball and sooner or later you'll get your shot. As fun as a crowd of puppies may sound, it doesn't make life any easier (believe us), they're hard to control and in some cases can be stressful for the animal too if they’re not already socialised. If you have an Owner, Handler or Trainer on hand, follow their lead and let them know what you’re looking for, if it’s unrealistic they’ll very quickly tell you and more often than not they’ll have great ideas of their own. Get down to the animals level if possible, this is where the action is and how you get the golden shots. That’s just our top 5, there’s plenty more to bear in mind so if you’re looking at a video project involving animals (or kids, you’ll find all the above is relevant), get in touch and we can share our experience. A view above Lake Morvich. Last week the team headed up to Aviemore, Scotland to test out the new SWIFT BASECAMP with a JEEP RENEGADE. Over 1,000 miles were covered in less than 2 days and both the team and gear were truly tested. The first leg of the journey took over 10 hours to reach the chosen destination. Light was already starting to fade, given the time of year, so we quickly shot the necessary scenes and grabbed an early night ready for tomorrow. Neil Greentree standing alongside his weapons of choice for taking on the Scottish Highlands. Not everyone was feeling the morning freshness the next day. Sonja battling the sun's rays. Neil and his son getting geared up for some mountain biking. The boys getting briefed by Dan for the next scene. Sonja on the hunt for some shots. After a hectic weekend, the team and vehicles returned home safe and sound with some stunning footage to show for their troubles. For enquiries on brand and lifestyle videos, CLICK HERE. Earlier this month I went on my first shoot as part of the Vintra production team, following a presenter to document a winter mini-break. All with the aim of putting together a video campaign for a number of clients in travel and leisure, promoting year-round holidaying in the U.K.
Lucky me! 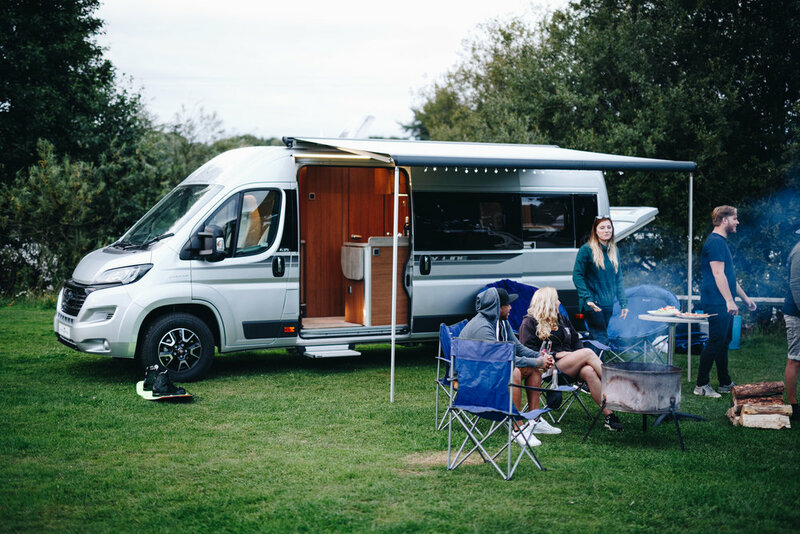 First month on the job and I’m already going away on glamourous mini-breaks... Then I saw the brief, we were on location in East Yorkshire, to investigate what Motorhoming in deepest, darkest winter was really like. Not quite the city break/spa weekend I’d imagined. Instead, I’d be spending the night in a Motorhome on the Grimsby coastline in mid-January. We based ourselves at Little End Corner Caravan Site, situated by a picturesque fishing lake. The location was such an idyllic setting, but the eye-catching surroundings were slightly spoilt on the first day by the weather; our welcome to Yorkshire was greeted by cold, wet and windy conditions, which made filming outdoors unpleasant. Fortunately, a tough filming day was made easier by enjoying an evening of laughter, pasta bolognese and gas heating, as the six of us comfortably relaxed in the Tracker RS Motorhome, protected from the harsh elements outside. 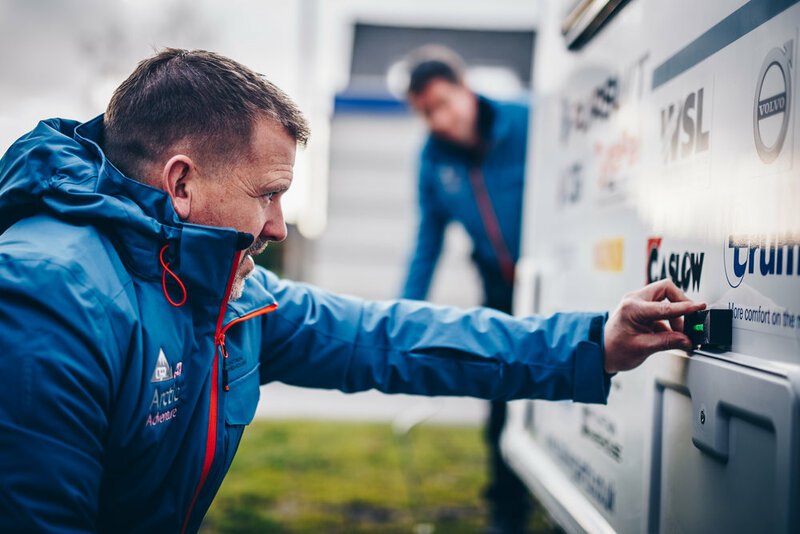 It was a tough night’s sleep as I foolishly turned off the heating in my motorhome, and woke up unsurprisingly freezing at 2am! I quickly defrosted after turning it back on, and will not be making that same mistake in the future. Our hard work on the first day was rewarded on the second, when we awoke to a stunning sunrise followed by a beautiful morning of sunshine, which made the lake setting all the more serene and tranquil. The team made the most of the morning sun as we captured our “man in the field” doing a little fishing and wildlife watching before a trip to a deserted Cleethorpes beach in the afternoon, where we treated ourselves to fish and chips. Amazingly, we were the only souls on the campsite, I guess camping near Grimsby in mid-January isn't for everyone, but we just felt so lucky on the second day to enjoy those peaceful settings by the lake and on the beach in ideal conditions - and we had it all to ourselves. 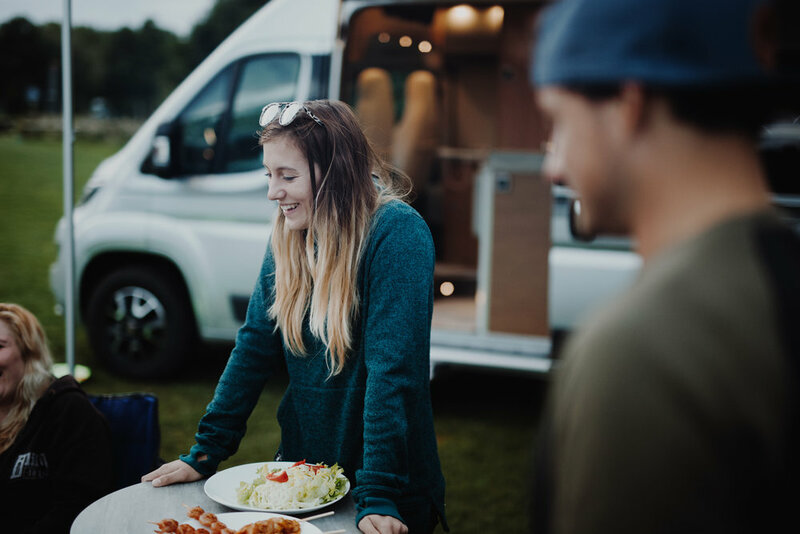 We captured some fantastic footage of the Great British outdoors and the experience has really energised us to make the most of the campaign. We’re definitely in agreement with our clients that people should take more mini-breaks, although I hope next time the team will be pitching the client that spa break, so I don’t end up pitching a tent! To kickstart Vintra's Monthly Pro Tips, we asked Alessi Heitman-Rice for his top 5 tips on how to shoot timelapse like a pro. Alessi is an award winning photographer and filmmaker and has shot motion-controlled timelapse for broadcast and film. 1. Always scout your locations out before you shoot. Although this may be a simple one, it's one of the most overlooked rules for new photographers starting out. Sunrises are the perfect example of why you need to pre-plan your shot, as often you will have little time in the morning to setup and compose your shot in the dark. The Sunseeker App on the App Store is an amazing tool for using it's 3D Live View to see where the sun will rise. The Sunseeker App was used to pre-plan this sunrise time-lapse. 2. Remember to account for camera buffer when setting your intervals. 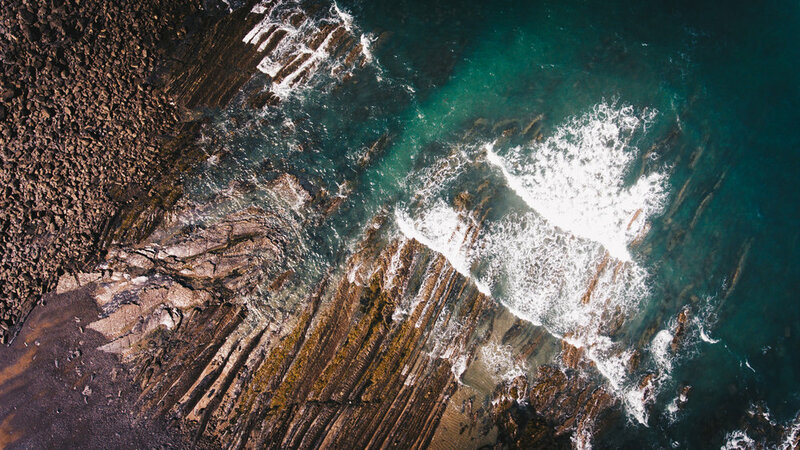 When setting intervals, new photographers will forget to account for their camera's buffer time. This is the time it takes for the captured photo to be saved onto the card. If the interval is too short, photos will be saved at irregular times, which will lead to jumpy footage. Most cameras will have a different buffer time, as processing power varies. If in doubt, 4 seconds is generally a safe rule of thumb to go by. 3. Use lenses that have a manual aperture to reduce flicker. Using lenses with a manual aperture ring will significantly reduce the flickering seen on a lot of time-lapse footage. Although auto lenses' apertures can be set to a fixed f-stop, there will be micro changes in the rings between each shot, it's this inconsistency that causes the flicker. If you already have footage with large amounts of flicker, GBDeflicker is a great After Effects plug-in to reduce it in post. 4. If something unexpected happens, leave the timelapse running. One thing about timelapse that makes it fun and also very frustrating is the amount of things that can go wrong. When faced with unexpected conditions during a time lapse, your best bet at having usable footage at the end, is to keep it rolling. There have been many times where I've wiped rain off the lens whilst shooting and the inconsistency between frames has made the footage unusable. DON'T TOUCH YOUR CAMERA. It started to rain during this test shoot and the temptation to stop filming was hard. However, I kept rolling and I ended up quite liking the effect from the rain on the lens. 5. Have fun and experiment. Sometimes it's good to just play around with new ideas and challenge yourself in different situations. Timelapse is a long process and there's a lot of kudos to anyone who has enough motivation to make a timelapse film, however good.